Discussion in 'SFNE Discussion' started by DylanBIZARRO, Mar 25, 2018. Do you think the South End theme change was a good idea? 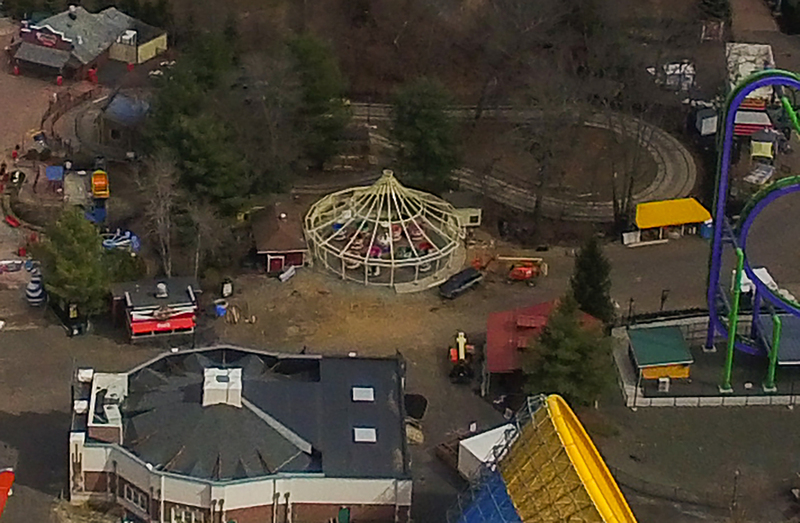 NOTE: I DID NOT FLY MY DRONE OVER THE PARK! I STAYED ALONG THE CT RIVER AND THE PUBLIC ROADWAYS NEAR THE PARK! Today I headed up to the park to do another drone update with @BizarroAj. The weather was good and we were able to get some good shots today! 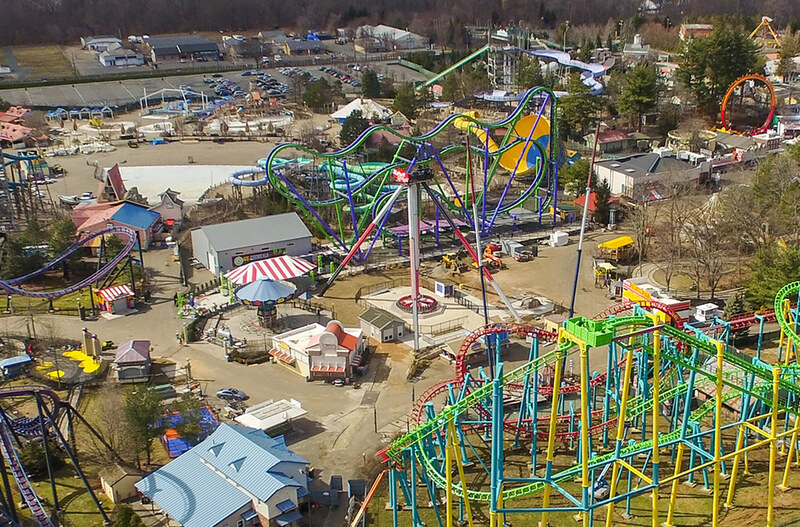 They were testing a lot of the rides today, such as Flashback, Batman, Wicked Cyclone, NESS, Pandy, etc. 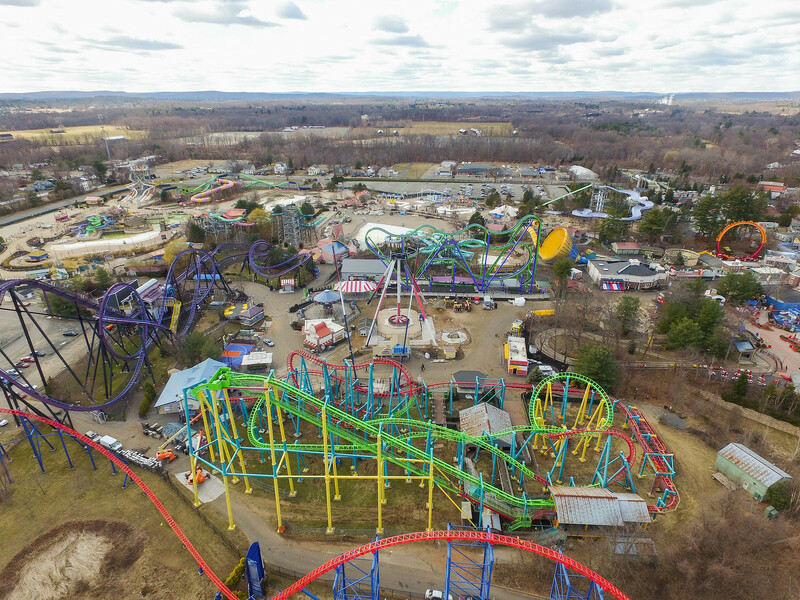 I think Mind Eraser is coming out great! 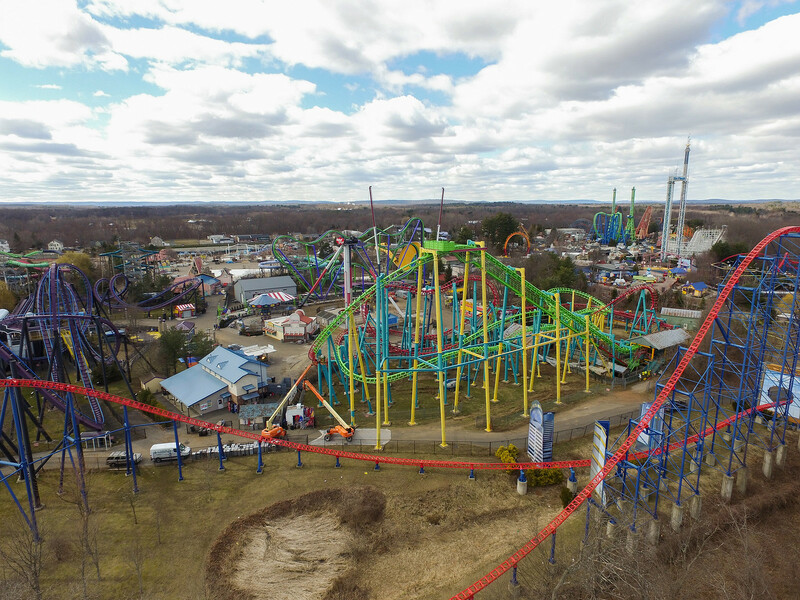 We could see it from the area we were flying the drone at, and we also could see Harley Quinn, which as AJ said, it looks smaller in person but that’s probably because of the area we were viewing it from. A front view of the park. Heres a close up of Teacups. Looks pretty good in that spot in my opinion. Teacups from a different angle. 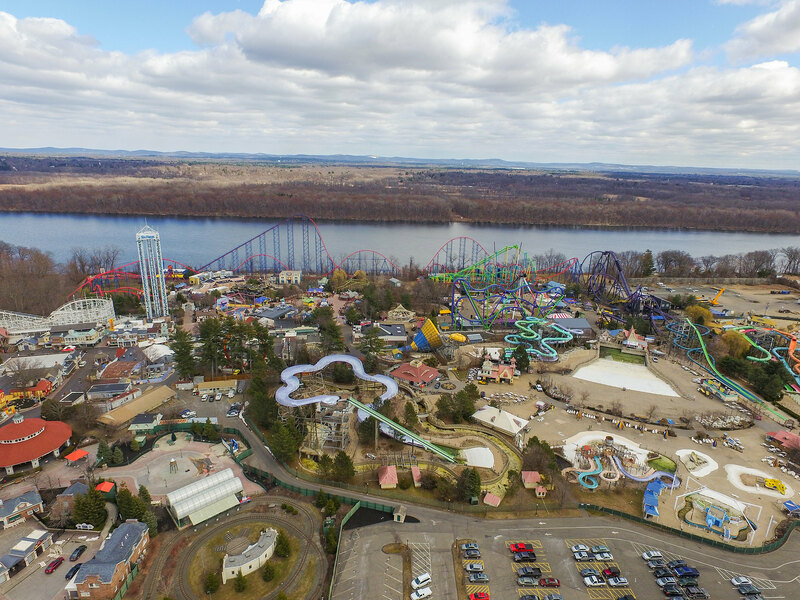 Now heres where we get into the closeups of Mind Eraser(Riddler) and South End. 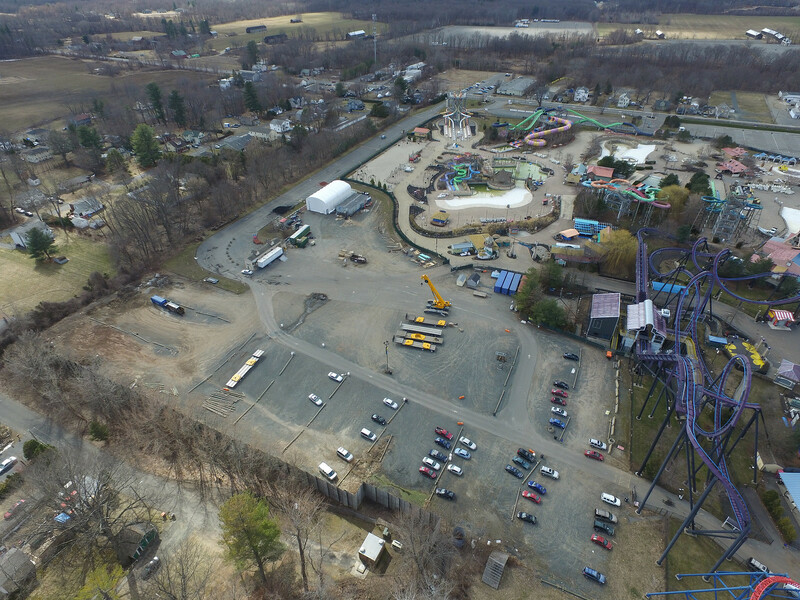 Zooming into some of these photos, you can see people working on Mind Eraser, and walking throughout the park. Heres a nice shot over the CT river overlooking South End. Mind Eraser(Riddler) looks a lot sharper with the new colors. Heres a close up of Harley Quinn and South End. 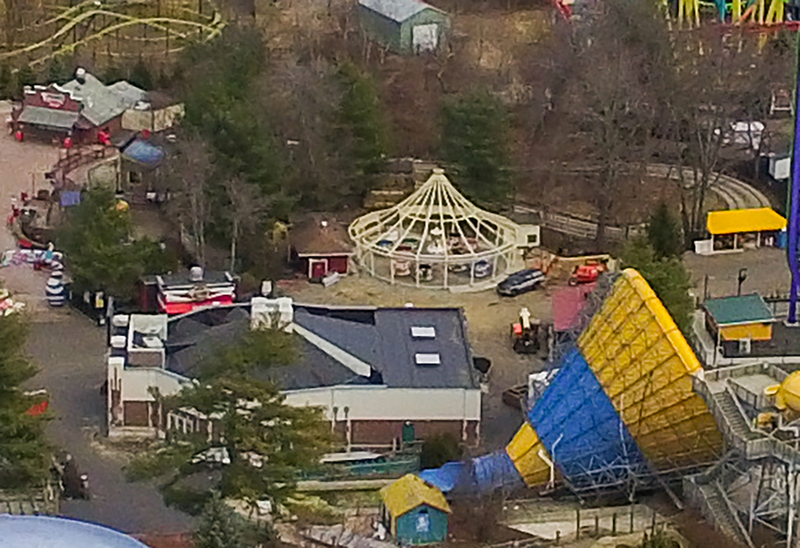 You can see slingshot in its new spot as well. Looks a bit tight but hopefully everything will work out well. 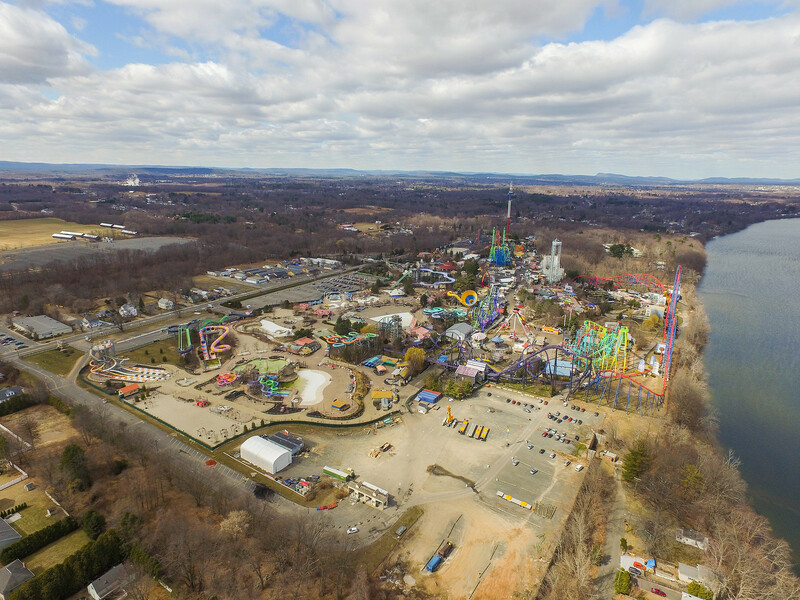 A nice shot of South End and Mind Eraser. Another shot of South End. Some close ups of Mind Eraser. Looking good! They definitely have some work to do before opening day. Aj was telling me how the weather this week is going to be nice so they’ll get a lot done. 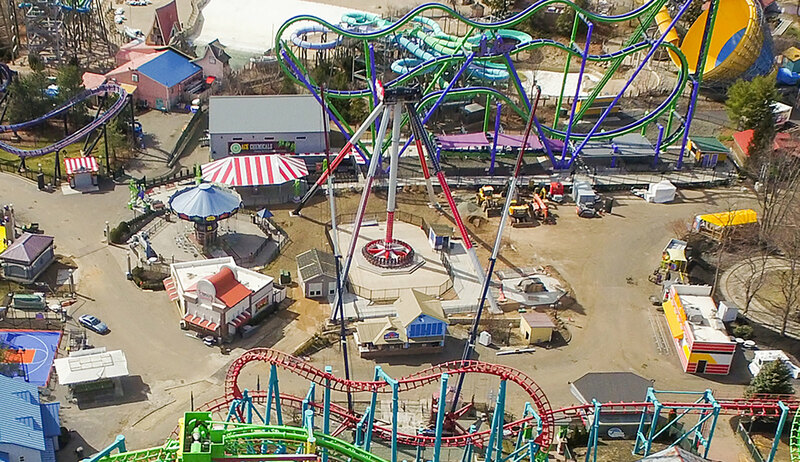 Again, in my opinion next to Superman and Batman Mind Eraser looks a lot better with the new color scheme! It doesn’t look similar to Superman anymore. Heres a shot of the parking lot I took. Doesn’t look like too much is going on. And heres the new bathrooms/changing rooms. Looks a lot better! I’m sure it looks good inside as well. Heres a close up in the maintenance lot. 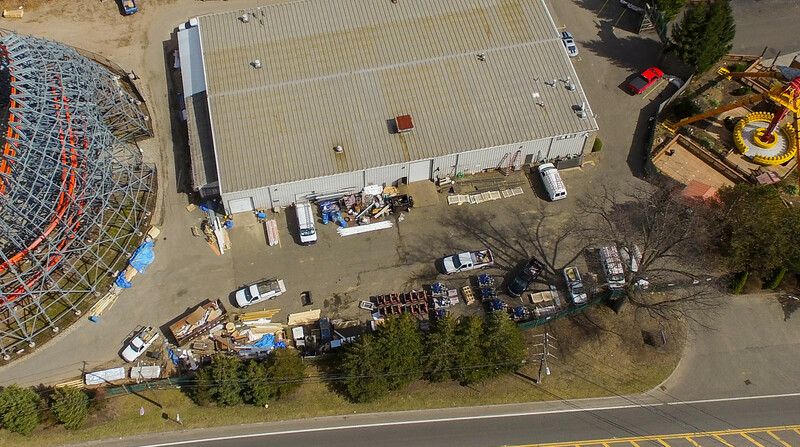 That about concludes the drone update. 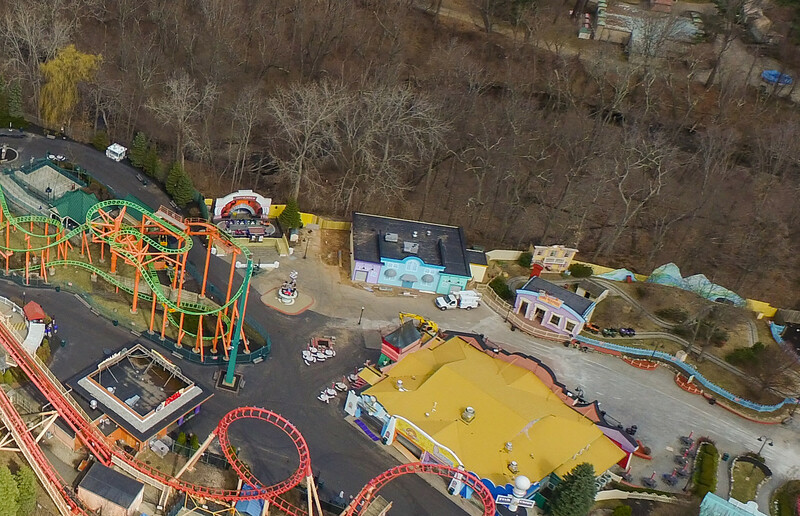 I actually may be doing a drone update next weekend as well before opening day. I’m also going to be getting some video as well that I’ll post to the youtube channel. I’ll probably do that next weekend. Feel free to definitely look for hidden things I missed or didn’t mention. 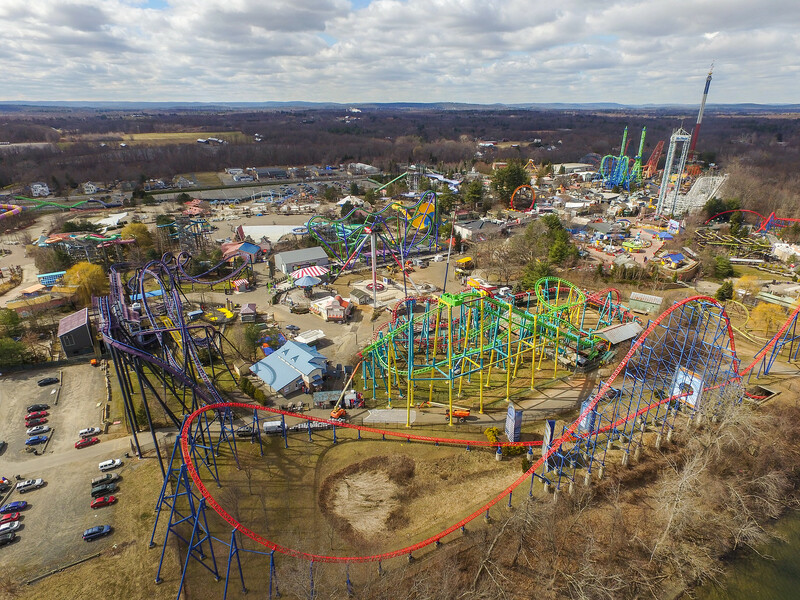 I think this year is going to be a good one and I’m definitely looking forward to riding coasters again! Awesome pics as always! I really like how Riddler looks, I always thought the colors before didn't look that great with Superman. I wonder how many guests will think it is a new coaster lol. Interesting that they decided to ditch the Looney Tunes stage, the speed trap looks a little odd there. Only other interesting thing I noticed is the 5-2 boxes for Superman are sitting in the lot and it appears that the red train is already on the track. Awesome shots thanks for doing this. 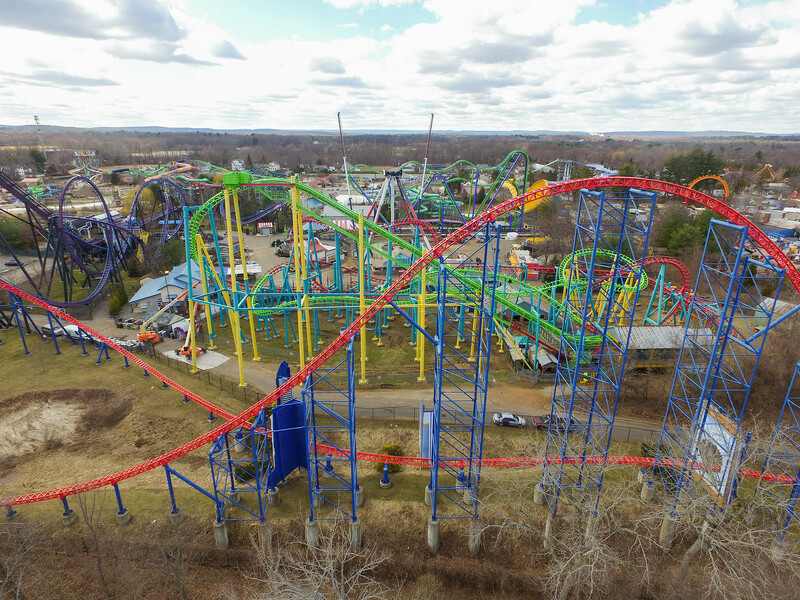 As you can see one of supermans trains is sitting in the maintenance lot still torn apart. 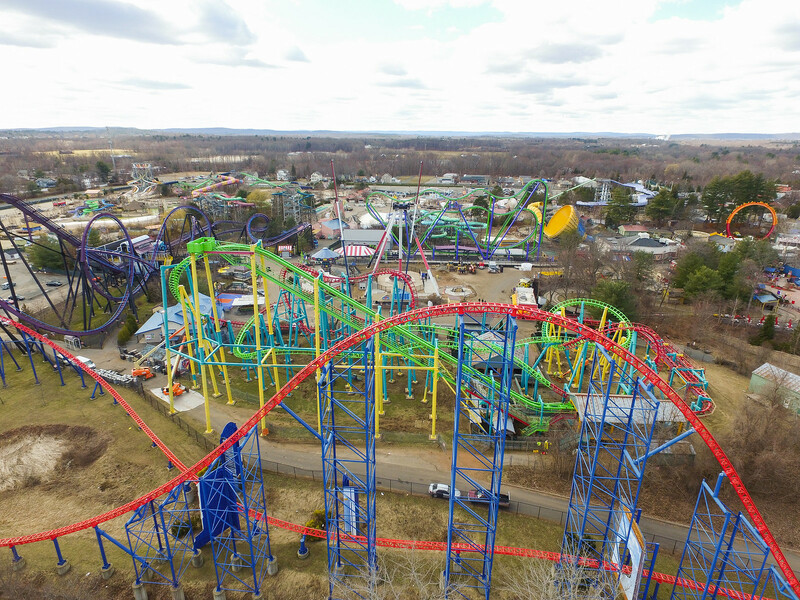 I had heard a rumor that Superman might not be ready for opening day or it would run 1 train. I know people will be mad but considering all the projects they had going on, they weren't able to get every thing done since they lost time for hitp. Nice pics! Paint job looks awesome. Is that PTC train in the maintenance lot Thunderbolt's or an old Cyclone train? 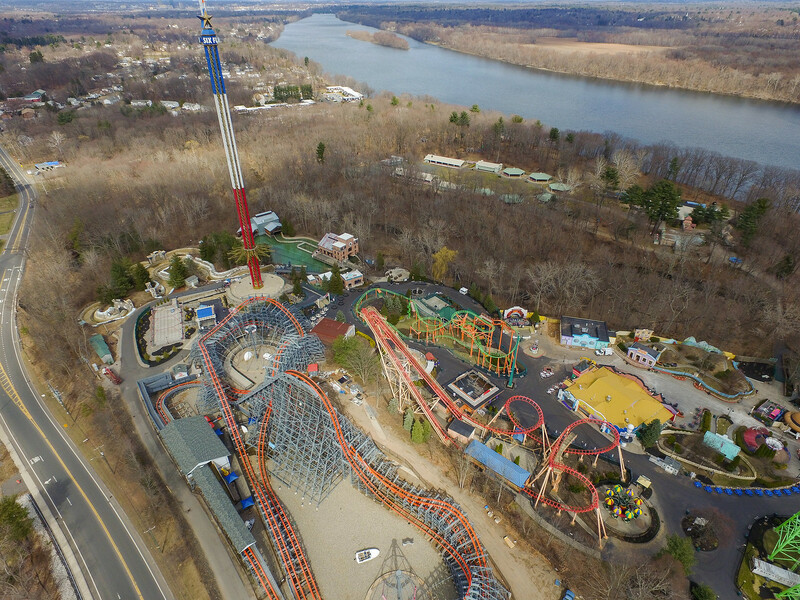 It’s Thunderbolt’s red train, I think you can see the blue train on the lift in one of the pics. ^The pathway doesn't look like it lost much if any of it's length around there so it should be fine. I do think it might look a little out of place and maybe they should have painted it some other color. One thing I noticed in the last update were some wooden panels in place on the side of Thunderbolt's brake run and those seem to be missing now. Maybe they did something with the braking system and made some sort of enclosure in there before to be able to work through the winter. Does seem a little weird that the red train looks ready to go when I believe the blue train is already on and the red train ran last season. Interesting that they oped to put Speed trap on the stage ind not spend the money to remove it. Green on Bright Blue. like I said in another thread not a fan. For me the colors do not fit what they are going for. It's going to be green and yellow, the bright blue just hasn't been painted yet. Green on bright blue? It's going to be green and yellow. Like what they did with Riddler at SFMM last year. I actually think the green looks amazing on the blue in person, but I’m pretty sure the final yellow will be deeper. No matter what it will pop and look good! In this shot you can see where the proposed warehouse/maintenance/office building was supposed to go on the far left of the employee lot. 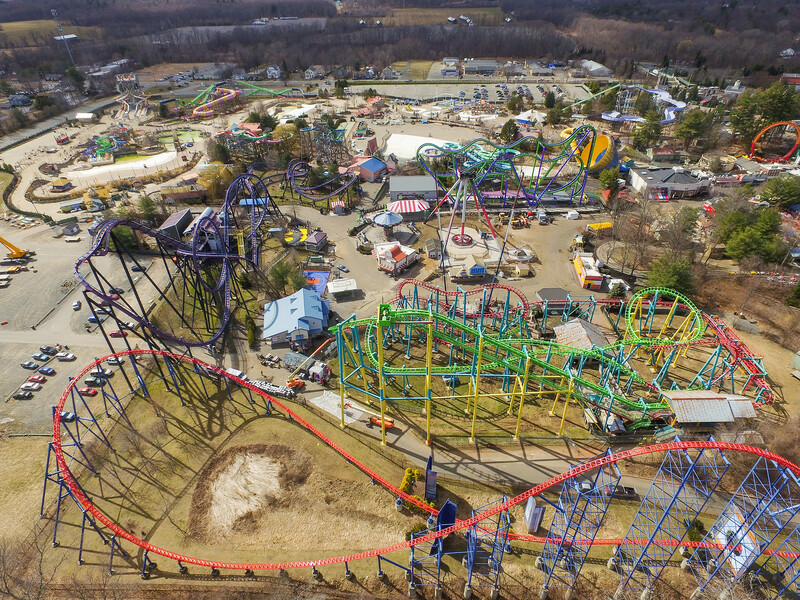 I hope they build it soon so they can expand the park. I for one really like the yellow and green color scheme, it really makes it stand out. Also, I know it didn't, but WiCy looks like it has a fresh coat of paint on the track in these pictures. Wish it always looked so orange! I’ve literally had to park there before. So they’d have to expand the employee lot in some way too.